Please help if you can. I have a Dewalt 734 and it has been working fine. Today, the roller stops when wood touches it. The roller is turning when there is no load on it. But, with the slightest pressure from a piece of wood, it stops and therefore the wood is not fed through. None of these worked but they didn’t seem like the problem anyway…I usually keep the planer in good condition. Again, the roller turns when I turn the planer on but when I feed wood through, even with a whisper of a cut, the roller stops. Sorry to be an idiot…how do I lower the cutterhead? I assume you mean something other than the main crank that lifts and lowers the entire assembly. By the way it is both rollers that stop. Check the speed selector and make sure it is secure in one speed or the other. It is a single speed machine. I’m sorry, I read 735 for some reason. I have a 733, which is just like yours but has one less knife. If memory serves, the cutterhead is ran by a belt, but the feed rollers are turned by a chain. I would suspect that there is problem with a Sprocket. I’m no expert, but it sounds like there may be a problem with the “drivetrain” for the rollers. There is a set of pulleys and chains connecting the motor to the rollers. Maybe something is wrong with that. You’ll have to remove the gear cover to see them and that might be tricky. As a test, while the motor is unplugged, you could try to spin the rollers by hand. I’m pretty sure that when everything is functioning as they should, they won’t spin. Ok I think you guys are right. Yes, with the machine off and unplugged I can hand turn the rollers. So, something must be wrong with the sprockets or drive chain. I really don’t overload it so I’m not sure what happened. Oh man like I need this. I suspect tomorrow will include a lost day of work and some cursing. I’ll let you know what I find. The fact that they turn until you put a piece of wood in suggests to me that the drive Sprocket is loose. It may be just a matter of tightening a set screw. If you have the manual, you may want to read and see if that will give you some info for tomorrow. Here is a link to instructions for installing a Shelix head. It has some reasonably good pictures of the assembly, and might help you tomorrow. Some people have opined that it is a good thing, as the tab will break off in the event of a jam or other situation where other more important parts can become damaged instead. They also suggest ordering more than one when you do replace the broken one, so you have one or more spares on hand for the next time. I just consider it a bad design. YMMV. You guys are awesome. I’ll take it apart tomorrow and see what the issue is. I’m sure I will be ordering a new gear…or two. Seriously I have not pushed this machine. I mean I run it a lot but I always take small bites. Ok…it was definitely a sprocket. The main drive sprocket had the tab completely sheared off. See the sprocket that has not tab in the middle…that’s the problem. Thanks for all the help everyone. I would have never thought to to take the planer apart and look for this. 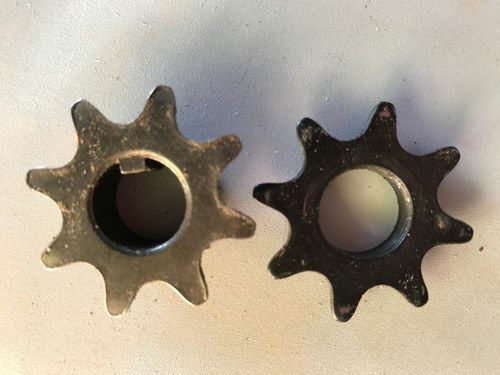 This is surely a long shot, but does anyone know if a version of that sprocket, with less teeth, is available? Ideally, I’d like to slow down the feed rate on my DW734 planer. If you slow in down you “may” run the risk of burning the wood or at least burnishing the wood. I would imagine the speed was engineered to what it is for a reason. It could be I know nothing. Something to think about. It’s a good point and definitely something to think about. But, if the sprockets were available, it could be tested fairly easily and be reversible. I have the shelix head installed in the planer. Not sure if that would make it more or less prone to burning. I just find that the planer is underpowered on wide boards and I have to take baby cuts. The shelix head aggravated this problem. My theory is that slowing down the feed rate would help.